The Manufacturing group capabilities encompass establishing supply lines (including importing); representing overseas suppliers; design, manufacture and service of products for: direct sale, tenderers; and other Great Western Corporation businesses; and products contracted to OEMs. While products are sold (and serviced) directly to the end users, other products are distributed through a network of independent dealers. These organizational capabilities enable Great Western Manufacturing to provide complete solutions to complex sourcing, manufacturing and distribution opportunities. A highly skilled and professional workforce offers expertise across all areas of metal manufacturing, from prototype to final assembly and finishing. Employees attend continuous training workshops to ensure all processes are updated and complete competencies are maintained. To retain its status as a leading manufacturer, Great Western Manufacturing utilises a wide variety of manufacturing methods incorporating design processes through to the modern equipment operated. CNC Oxy/LPG, high definition Plasma and Laser cutting. Modern CNC machine shop utilising bar fed lathes and machining centres with 4th axis capability. CNC Pressbrakes with capacity up to 170 tonne. 5m x 13m fully compliant sand blasting booth. Up to 5m x 12m paint booth capacity for spraying & baking. CMM / 3D measuring equipment. 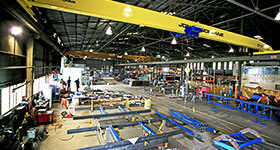 Each production hall is serviced by an overhead crane with a lifting capacity up to 10 tonne. Great Western Manufacturing is a quality endorsed company accredited with quality system I.S.O. 9001 - 2008, and our license number is QEC 1064 through SAI Global. As a result of commitment to quality control Great Western Manufacturing manufactures for some of the world's leading vehicle brands and also provides specialised equipment for the mining, construction and agricultural industries. The production and accounting of the business uses the Vantage MRP II manufacturing system software which incorporates order progress traceability with reliable computer generated capacity, requirement planning and monitoring. With a management team dedicated to excellence, an active Quality Assurance system, a workforce of trade experienced long serving employees and a sound track record of delivering the correct product on time, we are confident that we can be of service to your organization and associates. Please contact us so we can discuss your manufacturing requirements.